Ms Shanahan has a longstanding background in Australian and overseas economies and share markets and is a Fellow of the Institute of Directors. She is currently a non-executive Director of Phoslock Ltd, Clinuvel Pharmaceuticals Ltd, Bell Financial Group Ltd and DMP Asset Management Ltd, and a Director of the Kimberley Foundation of Australia and the SVI Foundation. She has recently been appointed as a member of Swinburne University's Inaugural Research Advisory Committee. Brenda is also a former member of the Australian Stock Exchange and Chair of St. Vincent's Health Melbourne Ltd and St. Vincent's Medical Research Institute, and Director of St. Vincent's Health Australia. Tony has over 30 years experience as a senior executive in government, corporate and legal roles. He is currently Chairman of IRESS Ltd. He was appointed as a Commissioner for the Australian Securities and Investment Commission (ASIC) in late 2006 and then as Chairman in 2007 for a four-year term. He was Chairman of the (International) Joint Forum of the Basel Committee on Banking Supervision from 2009 to 2011. Prior to ASIC, he was Managing Director and Chief Executive Officer at the Australian Securities Exchange (ASX) from 2004 to 2006. 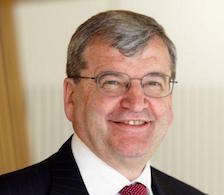 Tony was Chief Executive Partner at Mallesons Stephen Jaques between 1992 and 2004, having first joined the firm in 1977. Tony has a depth of experience in executive and non-executive roles. Professor Tom Kay is the Executive Director of ACMD, and the Director of St Vincent's Institute of Medical Research (SVI), a position he has held for more than 13 years. He is also an Honorary Endocrinologist, St Vincent’s Hospital Melbourne and Honorary Professorial Fellow, University of Melbourne, Department of Medicine at St Vincent’s Hospital. He is alo the Director of the Tom Mandel Islet Transplant Program at St Vincent’s, which carried out Victoria’s first successful islet transplant. Tom leads Australia’s largest type 1 diabetes research group at SVI and is the current President of The Immunology of Diabetes Society (IDS) and a Council Member of the International Pancreas and Islet Transplant Association (IPITA). His major research interests include autoimmunity and islet transplants. Professor Shitij Kapur is Professor of Psychiatry, Dean of the Faculty of Medicine, Dentistry and Health Sciences, and Assistant Vice Chancellor (Health) at the University of Melbourne. Shitij is a clinician-scientist with expertise in psychiatry, neuroscience and brain imaging. He trained as a Psychiatrist at the University of Pittsburgh, and undertook a PhD and Fellowship at the University of Toronto. He is a Diplomate of the American Board of Psychiatry and Neurology, similarly Board Certified in Canada and has a specialist medical license in the United Kingdom. Mr MacFarlane is non-Executive Director of both public and private companies in Australia and New Zealand. He retired from his executive role as Chairman and CEO of Deutsche Bank Group, Australia & New Zealand in 2014. Prior to returning to Australia in 2007, he spent seven years as President and CEO of Deutsche Bank, Japan. An economist by training, Mr Macfarlane held senior positions with Bankers Trust in Sydney, New York and New Zealand until its acquisition by Deutsche Bank in 1999. Connie sits on the OneVue Board and is Managing Director of the OneVue Group, an ASX listed fintech company. Her extensive experience in the Australian, Asian, European and North American financial services markets solidly underpins her role as Managing Director. In 2017 she joined the OneVentures Board, a leading Australian venture capital firm, as an independent Director. Connie was awarded the Centenary Medal for her contribution to Australian business leadership. She is a Founder of Financial Executive Women (FEW) and in 2015 was an Eastern Finalist for E&Y’s Entrepreneur of the Year. She has been recognised by Insights Success magazine as one of the ‘the 30 most influential Women in Business’, and most recently was awarded Chief Executive Officer of the Year at the Women in Finance Awards 2018. Angela Nolan is currently Chief Executive Officer of St Vincent’s Hospital Melbourne, having stepped into the role in November 2017. Prior to this Angela was the Executive Director of Acute Services, having transitioned from the role of Executive Director People and Corporate Support in 2015. Angela began her career as a Chartered Accountant at Arthur Andersen, working with organisations across a variety of industries, including healthcare, manufacturing, banking and finance and superannuation. After completing a second qualification in Human Resource Management and Industrial Relations, Angela moved to the ANZ Bank. Angela served for 10 years on the Boards of Inclusion Melbourne, a community based not-for-profit organisation which promotes community involvement for people with intellectual disabilities, and its associated Foundation, as both President and Treasurer. Angela was awarded the Australian Centenary Medal in 2001 for her work with Inclusion Melbourne. Patricia O’Rourke is the CEO of St Vincent’s Health Australia’s Public Hospitals Division. The Public Hospital Division is made up of two major tertiary and quaternary health networks in Victoria and NSW, worth $1.2B and with over 11,000 employees. Prior to this, Patricia was the CEO of St Vincent’s Hospital Melbourne. Patricia has more than 20 years’ experience in the health care industry, including nursing and senior management roles. Patricia currently serves as a Director on the Board of the Garvan Institute of Medical Research. She is also appointed to other health care advisory boards in both NSW and Victoria. Patricia is a graduate of the Australian Institute of Company Directors and a member of the Harvard Business Club of Australia. In an Australian first, leading researchers have come together to take biomedical research on a fast track to success. The Aikenhead Centre for Medical Discovery (ACMD) will be the first biomedical engineering research and education centre in Australia. Bringing together research and training from leading hospitals, universities and medical research institutes in a purpose-built centre, the ACMD will drive medical innovation to reduce the burden of chronic disease in the Australian community. The discoveries made at the ACMD will help to stem the tide of rising health costs, will generate new jobs in advanced manufacturing, and enable Australians to live longer, more productive lives.